My mom actually pointed out the fact that more of the Missions Impossible in Season 2 were like St. Tail, and I just couldn't get the idea out of my head. So I drew it. I tried to do some justice to this in watercolor style, which was a really fun experiment. I had to use the brushes really differently than how I'm used to doing it. Tricky, challenging, and exciting. And I like the final product. 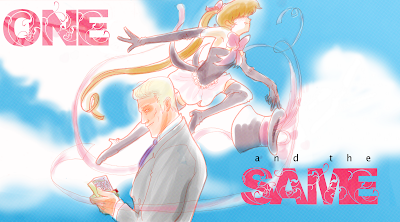 Well, I know nothing about Mission Impossible besides the fact that its theme song is in 5/4 time (I even knew that before your post in June), and all I can gather of St. Tail is that the girl appears to be Sailor Moon with only one ponytail. Though now I'm getting a nagging feeling that you've tole me about it before. But. The watercolor thing is fun. I like the lighting, especially on the silk hat. And your colors are nice. There, I posted a comment that had at least something to do with your art. Haha! Take that, foolish peanuts. Basically, they both end up taking on a lot of "impossible" missions to steal things and return them to their rightful owners. I'm also liking my experimentation with the brush/watercolor type stuff. It's fun, and there's no mess when you're on a computer. Besides, it's forcing me to think in new ways, which is all to the good.